Codices were folding books made of deerskin or paper, most were burned by the Spanish and only 16 survuive. 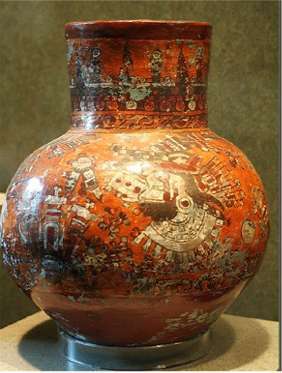 With the collapse of Tula in the 12th century, the primitive Chichimecs again poured into the Valley of Mexico from the north . 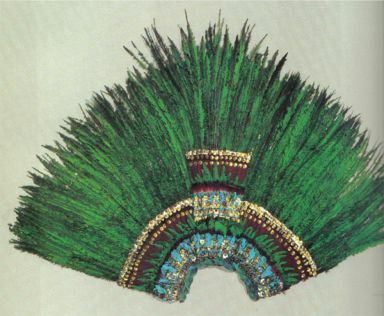 One Chichimec group that migrated into the valley, according to legend from the coastal area of Aztatlan were the Mexica and were also known as the Aztecs .Azteca is the Nahuatl word for "people from Aztatlan." According to the legend, the southward migration began in 1064 .
eagle knight basalt 1300 - 1500 A.D.
From the 13th century the Valley of Mexico was the nucleus of Aztec civilization .The capital of the Aztecs, the city of Tenochtitlan, was built upon raised islets in Lake Texcoco. 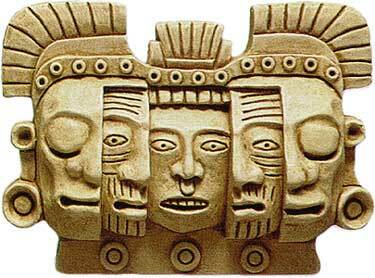 The Triple Alliance formed its tributary empire expanding its political hegemony far beyond the Valley of Mexico, conquering other city states throughout Mesoamerica. 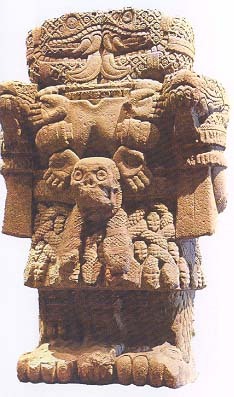 The most striking aspect of Aztec culture is the high demands for human sacrifice . In the Aztec world view, the sun and earth had been destroyed and recreated four times and they were in the age of the fifth sun, and destruction was imminent . Naturally, they wished to avoid this fate and believed that through intervention through the sun god, Huitzilopochtli this could be done, if he was appeased . The greatest act of reverence was to offer the sun god, the source of life in return. 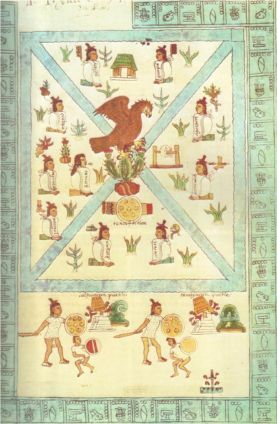 Without these sacrifices, it was feared the sun might stop rising or disappear an it does during an eclipse .The Aztec saw themselves as "the People of the Sun," whose divine duty is to wage cosmic war in order to provide the sun with his tlaxcaltiliztli ("nourishment"). Without it, the sun would disappear from the heavens. Thus the welfare and the very survival of the universe depends upon the offerings of blood and hearts to the sun, a notion that the Aztec extended to many of the deities of their pantheon.